Priced at $299 Incredible Value!! 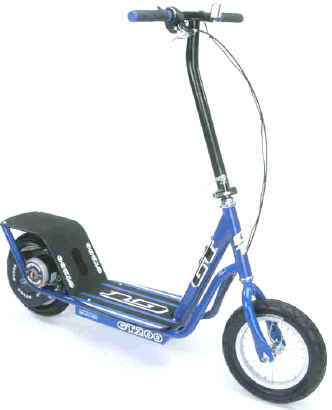 The 2004 GT 200 Electric Scooter is an all around fun vehicle. This unique stand-up electric scooter features the new downtube console with convenient on-off switch, light and charger port relocated for easier access. Top-end speed is approx 15 MPH. This electric scooter is an outstanding value. New and improved with the rear band brake.